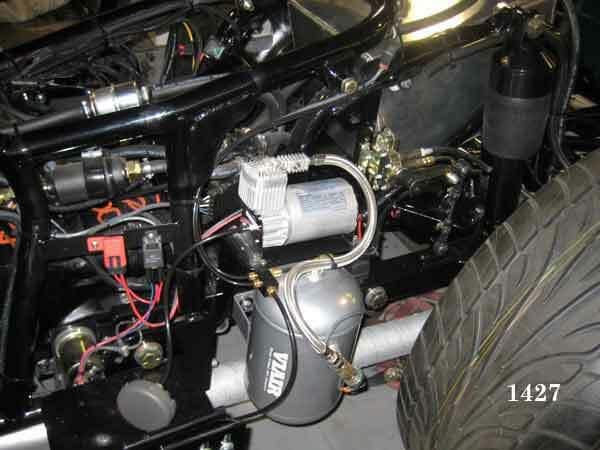 Here are some instructions for installing your air ride kit. Note: Although not necessary, the installation process is much easier if you remove the body. 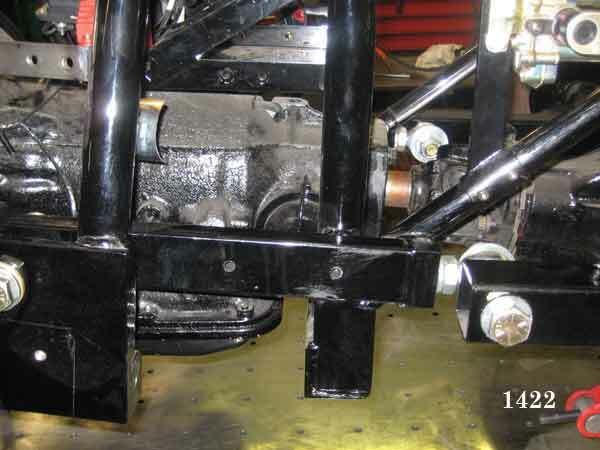 Jack up the rear of the frame and set it up on jack stands to take the load off of the axle. Remove the wheels and tires and then remove the factory shocks and springs. (Don’t forget to keep a jack under the pumpkin) Install the air shocks in the upright position. NOT how the factory springs were installed! (See image 1423) Install the provided spacers as shown in images 1424 and 1425. You will see in image 1422 that there are two 5/16" holes drilled in the center of the piece of 1x2" square tubing on the rear of the frame on the left side of the trike. Center the first hole on the perpendicular piece of round tubing that is welded to the inside of the square tubing. Then move 3 3/8" towards the front of the bike and drill your second hole. You can see in image 1427 how the air ride assembly bolts on using these two holes. Image 1423 shows where the bracket for the leveling arm saddles on the frame tubes. It only fits in one spot, so placement should not be an issue. Hold the bracket in place and drill your first 3/16" rivet hole. Insert a provided bulkhead rivet (to keep the bracket from moving) and then repeat for all 4 holes. 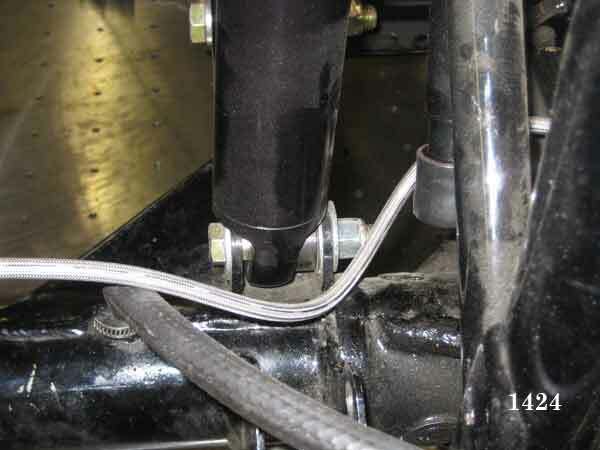 Once the leveling arm is installed, attach the steel linkage with the rubber ends to the arm. Attach the small black tab to the other end of linkage. 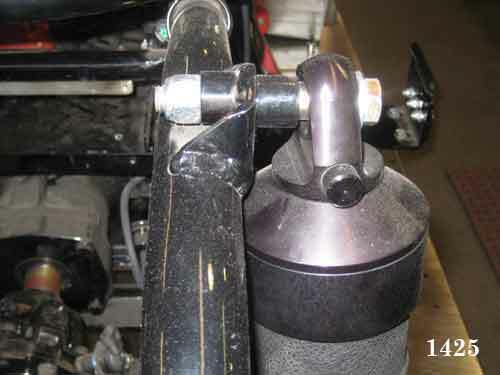 Adjust the height of the rear end using a jack until the swing arm is level with the frame. This will be your ride height. 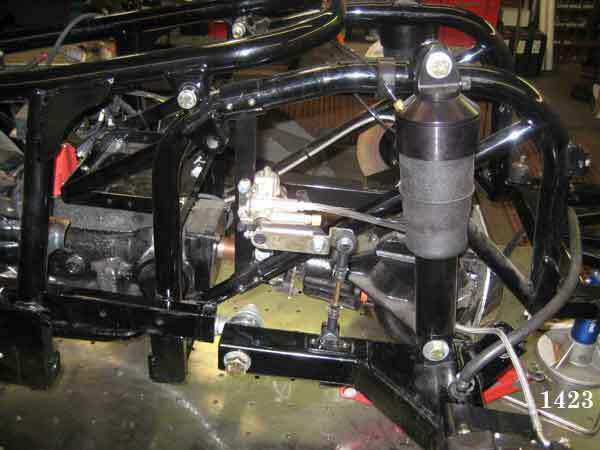 The steel linkage should already be cut to the appropriate length, so with the swing arm level; the tab on the bottom of the linkage should set flat on the swing arm. (image 1423) Mark your holes and rivet on the bracket. Using a 1/4" air line, come out of the top fitting of the air tank and go to the bottom inlet of the leveling arm valve marked "tank." Then from the middle outlet of the leveling arm valve, run 1/4" line to the provided "Y" adapter/reducer. Run 1/8" line from the "Y" to both air shocks. To install the brass air line fittings for the shocks, first remove the white plastic keeper from the fitting. (Note how the small brass feral is seated in the fitting, and DON"T lose it.) Slide the fitting onto the air line, and then slide the brass feral on about 1/8". Then screw into the port on the top of the bag. From the front side of the air compressor, run a 1/4" line to the provided air filter. Mount the filter casing in a convenient location so the foam inner filter can be changed periodically. Run the red power wire from the air ride kit to the solenoid on the opposite side of the trike. Either attach the wire to the "switched" side of the solenoid (the opposite side of the fused yellow power wire. There should be a wire labeled #36 or Hot Fuse Box.) OR attach the red wire to one of the studs on the back of the fuse box. Run the black wire from the air ride kit to any available ground. Use an existing bolt, or drill a hole and attach one to the frame. That should do it! It's a good idea to test the system before putting the trike back together. Use a squirt bottle full of soapy water and spray on all of the fittings. If you don't get any air bubbles, you are leak free and ready to ride! Don't be afraid to call us with any questions. Good luck and thanks for ordering!